Lou's Sextet is an eight piece band, formed 6 years ago and still together with largely the same line-up and personnel - drums, bass, guitar, keyboards, harmonica, bongos, tenor and alto saxes, vocals. We play a wide range of music, mainly swing and mainstream jazz, but a good mix of other things. Vocals provide about one third - half of our performance. The vocalist sings in a Sinatra style mostly (Nice 'N Easy, Have You Met Miss Jones, The Best is Yet To Come,You Make Me Feel So Young, Come Fly With Me.) He also sings in other styles - Blues, Rock 'n Roll, Fifties songs. 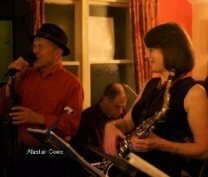 Lou's Sextet can provide a mellow background for a reception, or an upbeat performance for a pub or a party, and as we have a wide repertoire we can adapt to the mood of the event. Presentation is very important to us, and we are well rehearsed, dress up and 'put on a show'. We like the band to be a unit, musically and as a group of friends and think our enjoyment comes through in our work. We play at parties, anniversaries, weddings, charity events, supper dances and, of course, pubs. We are often booked for the over 40 age-group, as a lot of our music appeals to that group. We really enjoy playing pubs, where we go down very well with a younger group, who like Robbie Williams and Michael Buble.